It can be quite frustrating to not know where your deliveries are at, especially if your goods will be transported over long distances. With each passing minute of not being able to track your shipments and cargo, you find yourself wishing that you had more control, or at the very least, easy access to information about the progress of your shipments. You can grunt with frustration or threaten imaginary people all you want, but fast, easy, and convenient freight tracking is just not possible with some companies. As such, you need to be careful who you trust to be your service provider. There are only a few out there that provide excellent tracking options, and one of them is Conway. Conway’s roots date back to as early as 1929, when Leland James established the regional trucking company that was then known as Consolidated Truck Lines in Portland, Oregon. From the time it was founded, the establishment experienced huge and remarkable success, which was partly due to daring acquisitions and impressive expansions. Later on, the company got a new name and was called Consolidated Freightways or CF. This is also known by its unofficial name – Conway Trucking. Over the years, the company founded by James underwent numerous changes. 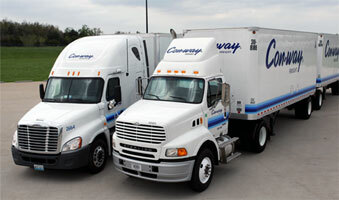 One major milestone was the founding of Conway Freight, which was formed in order to provide short-haul services to the markets that couldn’t take advantage of CF services. As part of this business strategy, regional companies like Con-way Eastern Express, Con-way Western Express, and Con-way Central Express were established, along with their corresponding service centers. On the day they first opened their doors to the public, the said carriers handled a total of 113 shipments, all made possible by 334 trailers, tractors, and trucks as well as 230 employees. At present, this Michigan-headquartered motor carrier is the most enormous among the divisions of Conway, Inc. and has over 32,750 trailers and tractors, 16,600 workers, and over 365 operation sites. Its revenues in 2009 reached a remarkable sum of $2.6 billion. Conway Freight is nothing if not sensitive to its customers’ needs, including the need for various options to track their freights. Conway offers timely and reliable cargo tracking and shipment status updates. The company accomplishes this feat through serving numerous direct points as well as making a broad range of Conway Freight tools available for customers to use to keep tabs on their LTL (less-than-truckload) cargos. One such tool that registered users will find particularly useful is the Enhanced Multi-PRO Tracking. With this tracking option, you only need to enter your custom reference number, your PO number, bill of lading number, or PRO, and you’re all set. Those who aren’t registered users will also find Multi-PRO Tracking to be a great alternative since it allows them to trace as many as 12 PRO numbers all at the same time. What’s even better is that Conway offers its registered customers the ability to proactively get information by choosing to receive email notifications regarding the status of pickups and deliveries. Lastly, the company’s HTTP and XML tracking tools, which allow you to incorporate the company’s tracking engine into your very own application or site thereby reducing the time and effort involved in tracking, are an absolute godsend. Conway offers the ultimate in freight tracking so you need never be anxious about the status of your precious shipments and cargos. With the various options offered by the company, tracking your freights has never been faster, easier, or more convenient.